Back in the fall, the Wikimedia Foundation announced that it was shutting down hundreds of Wikipedia accounts over paid edits, and that it was investigating editors being paid for their editing. This came after a site called Wiki-PR was exposed for engaing in the selling of such edits. In November, the foundation sent Wiki-PR a cease-and-desist. Paid editing on Wikipedia drew a lot of attention in the media, yet just the following month, one of the foundation’s employees apparently engaged in paid editing, and has now been let go. Sarah Stierch became an employee last April after a paid fellowship with the foundation. She has gained quite a bit of respect from her peers, which even continues through her firing. She’s been lauded for her efforts to get more women editing Wikipedia, and reportedly coordinated an “edit-a-thon” to create new articles on female historical figures. I’m writing to let you know that Sarah Stierch is no longer an employee of the Wikimedia Foundation. The Wikimedia Foundation has recently learned that Sarah has been editing Wikipedia on behalf of paying clients, as recently as a few weeks ago. She did that even though it is widely known that paid editing is frowned upon by many in the editing community and by the Wikimedia Foundation. 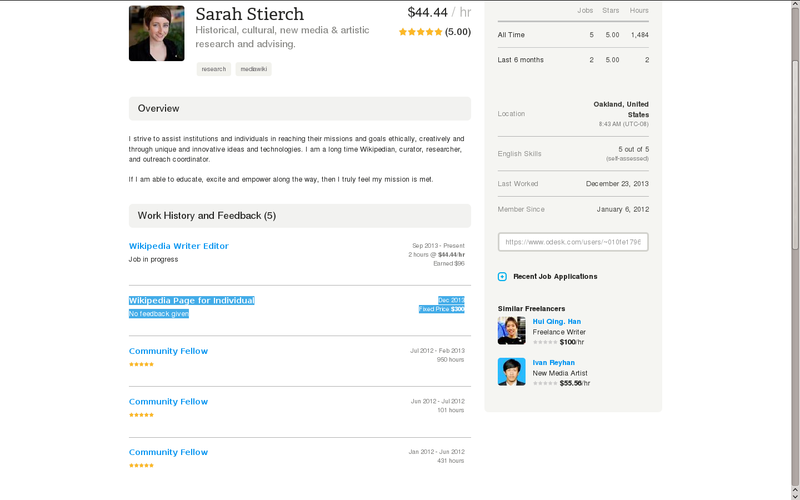 The Wikimedia Foundation values Sarah a great deal. She has been an active Wikipedian since 2006. She is committed to increasing dialogue between cultural institutions and our projects. She has worked hard to increase the presence and voices of women and other minorities in our projects, and she is a warm welcomer of new Wikipedians. Her work in Program Evaluation has been important and necessary. She is a good friend of many of us. Everybody makes mistakes, and I would like to believe that the Wikimedia movement is a place of forgiveness and compassion. And so I ask you to respect Sarah’s privacy at what is surely a difficult time for her, and to join me in wishing her every future success. I sincerely hope that Sarah will continue her important work as a Wikipedian and member of the GLAM community, and I thank her for the commitment and energy and thoughtfulness she has brought to her work at the Foundation. The page in question remains a mystery. It’s not like Google or other legit native advertising on the web where it’s marked as sponsored. And that’s part of the problem. Wikipedia is one of the most highly-trafficked sites on the web, and its pages often appear among the top of search results. Unfortunately, you never know when something was written there because an editor was paid to write it, and that’s likely why Wikimedia, as much a it may respect the work Stierch has done, was forced to let her go. It can’t convey a tolerance for this.